Celebrity Jewelry : Discover the top of the most expensive pieces! Celebrity jewelry is opulent, stunning and very expensive. We often see unique pieces on the Red Carpet and appreciate the wearer’s style. But where is the top limit of expensive? How much would you expect to pay for celebrity jewelry pieces? Since many women want to know how much a certain piece costs, we have decided to create a top of the most expensive celebrity jewelry. Read further to discover the most expensive piece of jewelry worn by a celebrity. It was a magical night at the Oscars for Gwyneth Paltrow because she dazzled everybody with her gorgeous look. Her unique diamond cuff bracelet featured no less than 2,368 diamonds. The name of the bracelet was “Hearts of Winter” and we all agree that she stole our hearts with that fabulous piece of celebrity jewelry. At the 2010 Oscars, Kate Winslet chose to wear a dazzling celebrity jewelry piece. It was a canary diamond necklace which she matched with yellow diamond earrings and a bracelet. We usually don’t advise wearing sets unless we are talking about this gorgeous diamond set. Kate paired her canary diamonds with an elegant silver gown and we loved her for it. At the 2009 Oscars, Angelina Jolie appeared wearing a breathtaking pair of emerald drop earrings. With a classic design and 115-carat emeralds, her earrings became a fashion statement that still remains in our memories. Fashion critics around the Globe noted this pair of emerald drop earrings as one of her best looks ever. Charlize Theron is one of the most stylish and classy actresses from Hollywood. It comes as no surprise that her jewelry is equally gorgeous. At the 2013 Oscars, she wore a pair of diamond cuffs that got everybody’s attention. She matched them with a gorgeous geometrical white dress and a pair of subtle diamond studs. We also love the hairstyle. We all love Nicole Kidman, but we loved her even more after the 2008 Oscars. Her custom diamond necklace featured over 7,500 diamonds. The rumor is that it took over 6,200 hours to create this stunning piece, but it was worth it. A multi-strand statement diamond necklace without any other piece of jewelry and an elegant black gown is how you make an entrance. Anne Hathaway made quite an impression at the 2011 Oscars which she co-hosted with James Franco. 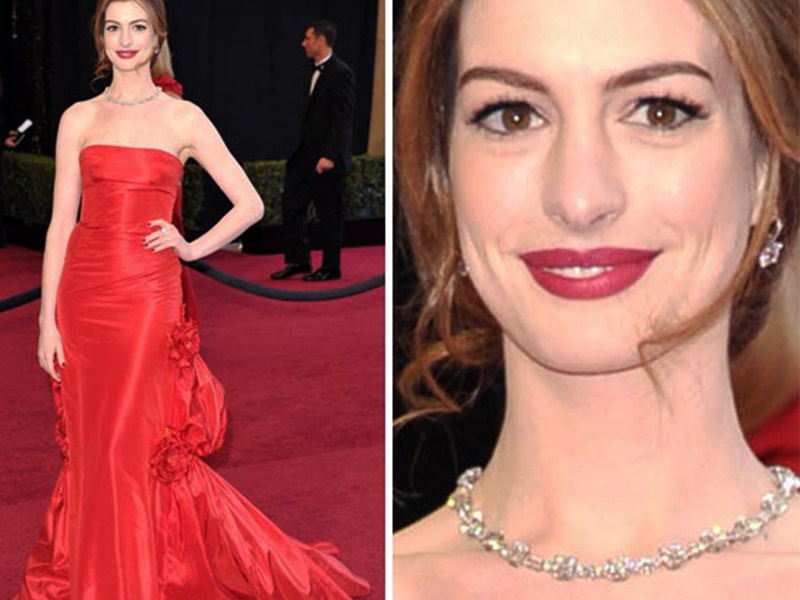 When it comes to celebrity jewelry, Anne Hathaway is usually subtle and doesn’t get as much attention as her colleagues. However, this time was different. Her stunning diamond necklace of 94 carats caught all the eyes. She exhibited an impeccable style pairing her expensive diamond necklace with subtle diamond drops and a gorgeous red gown. 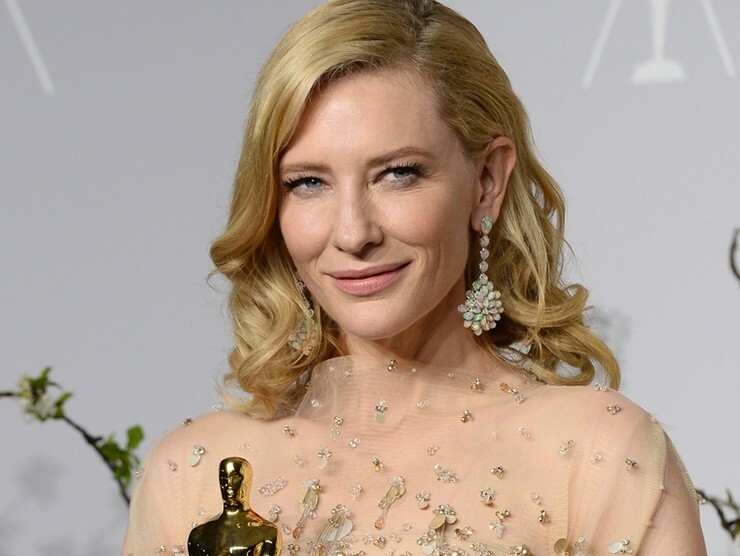 As we all know, Cate Blanchett always has an impeccable style and the 2014 Oscars were no exception. 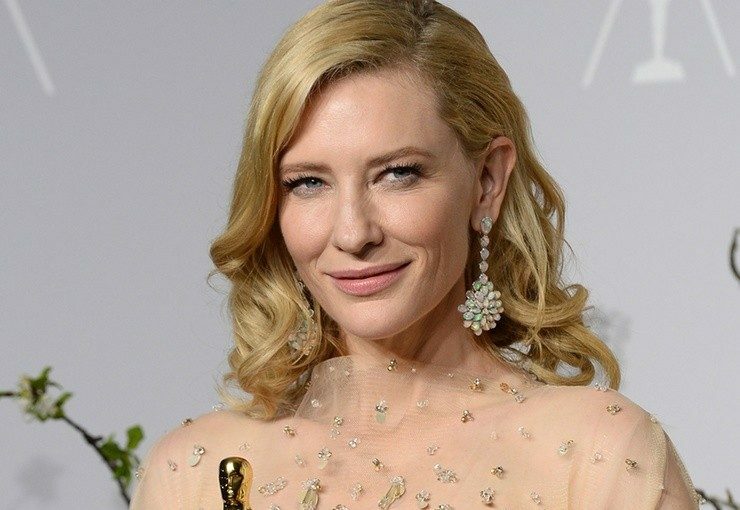 Coming very close to the most expensive celebrity jewelry piece, Cate Blanchet chose a pair of splendid earrings featuring opals set in white gold with diamonds. She matched them with a diamond bracelet and ring. Her gown was also exquisite and proof that more statement pieces can work together. We have reached the most expensive celebrity jewelry piece and we have to say that it is absolutely splendid. At the 1998 Oscars, Gloria Steward wore a $20 million necklace which featured a 15-carat sapphire and lots of diamonds. This necklace was a custom design and, as you can see, a piece of history as well. It resembled the famous fictional “Heart of the Ocean” necklace from Titanic. Well, perhaps Gloria Steward (who played the role of the old Rose DeWitt Bukater) didn’t drop it into the ocean, after all. Perhaps she only pretended to do it so that she can wear it at the Oscars. 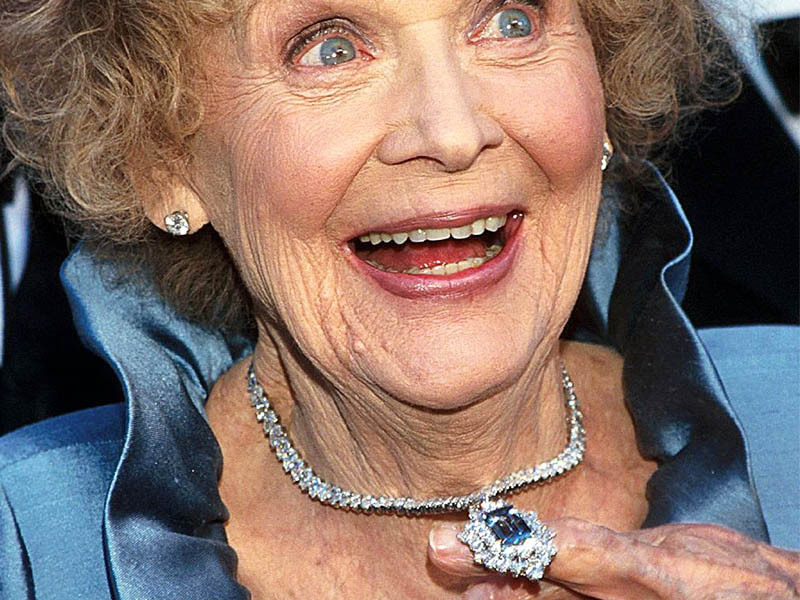 It’s needless to say that wearing this necklace was a wonderful idea for the actress nominated for her role in Titanic. Celebrity jewelry is always fascinating because you can always see unique custom pieces. And speaking of unique jewelry pieces, check out Ana Luisa online jewelry shop. We feature only limited-edition designer jewelry pieces which any woman would love to wear.